Khartoum — Assistant of the President of the Republic, Faisal Hassan Ibrahim, affirmed that the government is exerting efforts to address the current economic crisis. During his meeting Thursday at the Republican Palace with representatives of the diplomatic missions accredited to Sudan and the honorary consuls of Asian countries, Dr. Faisal gave an enlightenment about the current economic situation in the country. 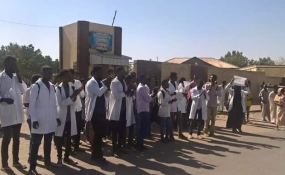 He said that the blockade imposed on Sudan has played a role in exacerbating the current economic crisis, referring to the efforts of the state to provide flour and fuel and continue efforts to solve the liquidity cash crisis during the month. The Assistant of the President has denounced involvement of some political parties and their support to the demonstrators for undermining the country's security and stability, explaining that peaceful demonstration is guaranteed by the Constitution and law without sabotage or damage to public and private properties.